Did you hear the news? SweetStamps added a new collection line! 18 amazing ATC stamps, called ArtstfArtsy. I another elaborate project in the works, but time got away from me and it just didn't get finished. I promise that I will share with you in the next few weeks to come. So instead I made a card, which I am swooning over! I just love the pink and gray color combination. Super cute and love the flowers in the basket. So pretty with the soft colors and out of the box image. Oh Calypso, I love the pink & grey combo & those flowers in the basket are so adorable! Great card. Your color combos is fabulous- I am always a pink girl....! Love the little flowers in the bike basket! Love this card! Awesome design I love the soft colors and the added flowers in the basket. Gorgeous design! Love the soft pinks and grays - and the flowers in the basket are adorable! Beautiful card!! Love it! Love the soft colors you used and the added flowers in the basket, so fun!! Just love this stamp! I love the colors you used on your card and how your image extends beyond the edge of the die cut. That Lady Kate Edger is the perfect die cut to finish off the card. Thank you very much for joining us this week at Cheery Lynn Designs. I adore how you added little flowers to the basket on the bike! This is so cute! What a sweet card. Love the flower bouquet coming out of the basket. Thank you for joining us this week at Cheery Lynn's Challenge and best of luck. What a sweet card - love the Lady Kate edger that you used. 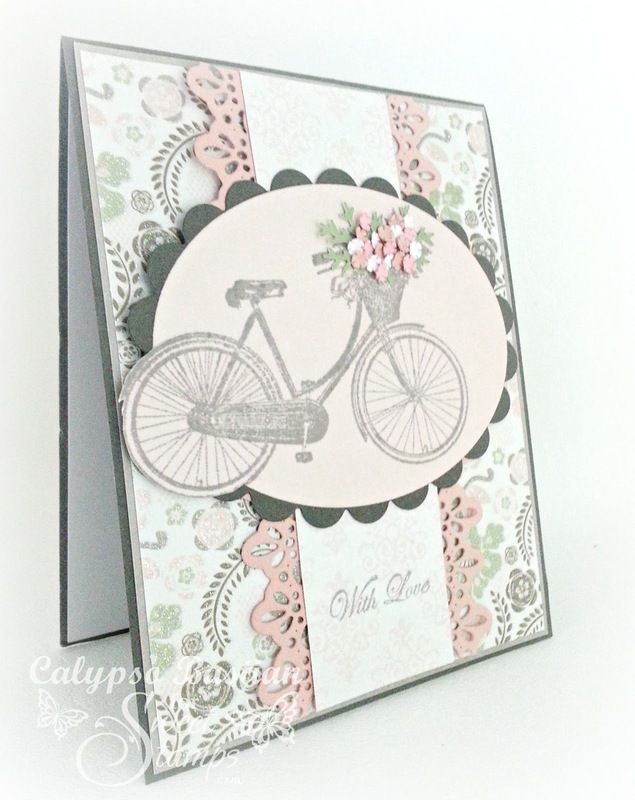 Thanks so much for joining us at the Cheery Lynn Designs Challenge and good luck! So beautiful! Love what you did with the flowers in the basket! Gorgeous paper choice! I really love that bike! So gorgeous. I love how you did the basket of flowers. So clever. Love love love the colors. Soft and pretty.